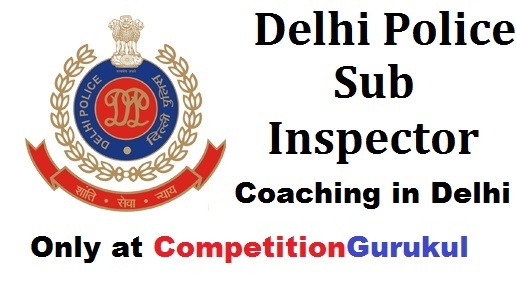 Competition Gurukul is the pioneer institute for the Delhi Police Sub Inspector (SI) recruitment coaching. At Competition Gurukul, we provide high quality and result oriented coaching at the expense of moderate fee. This year, we are conducting Delhi Police SI Recruitment-2017 coaching with more comprehensive coaching segments. Our highly qualified and experienced faculty have designed the coaching program in such a manner that are fully focused on concept development and problem solving approach. The classes are held five days in a week with regular test. Besides this, our study materials are fully updated and are precisely designed to meet the standards of the Delhi Police SI recruitment examination. Complete coverage of?syllabus before Delhi Police SI recruitment exam. Individual teachers?for each subject - English, Maths, General Knowledge and Reasoning. Highly qualified teachers with years of experience and excellent coaching delivery. Interactive session?held for?Concept development and time management tricks?for cracking Delhi Police SI exam. The admission?for fresh batches?of Delhi Police Sub Inspector Recruitment Exam-2017?Coaching?have started. Be the first to get admission for getting immediate benefit.